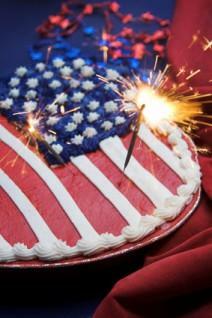 Decorate a patriotic American flag cake using fondant. 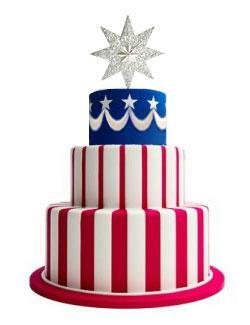 Fondant makes creating designs featuring the stars and stripes easy. The American flag is a relatively simple cake design to create, so do not be afraid to get creative when it comes to your cake. Roll out white fondant to ¼ inch thickness and cover the cake. Trim off excess and smooth sides. Cut out a rectangular piece of dark blue fondant and use a very thin layer of buttercream to affix it to the upper left corner of the cake. Using the smallest star shaped cookie cutter you can find, make star shapes out of white fondant and attach to the blue part of the cake. Cut out red stripes to place on top of the flag; measure the spacing accurately so the red and white stripes are even. Instead of adding white stars on top of the blue rectangle, you could also cut stars out of the blue fondant, allowing the white fondant to show through the blue. The flag design can be on just the top of the cake, or you could extend it down the sides of the cake for a finished look. Even if you have a tiered cake, you can still make it an American flag cake, and fondant will help create the look you desire. Creative cake decorating can make for a truly unique design. Cover all three tiers in red and white strips of fondant icing. Be sure to line seams up so you do not have gaps. Roll out dark blue fondant and cover the top tier. Mark out where you want to place the swags on each tier using the top part of a glass to create a gentle imprint. This gives you a light half circle and helps in placing swags evenly. Measure the length of each swag mark and then cut white fondant into as many rectangular pieces as you need to fit around the top cake tier. Remember not to measure straight across to and from each corner, but instead measure the sides of the glass you used to imprint the cake. Otherwise, your fondant's length will be too short. Create the curve shape and line up with the markings on your cake. Affix the swags to the cake using gum paste glue or royal icing. Roll out additional white fondant. Using a small star-shaped cookie cutter, cut enough stars to cover where the swags meet on the top tier. Add to the cake with gum paste glue or royal icing. Top the cake with a large glitter star or other cake topper that you desire. Stack up three cake tiers that have been crumb coated and then covered in white fondant. Take a large piece of rectangular fondant and affix long, thin strips of red rolled fondant to create stripes. Once the red stripes are set to the white piece, attach the flag to the stacked cakes in a draped manner, flowing down all three tiers. Add fondant stars in gray, coated in an edible luster, around the rest of the cake. Use thin strips of blue fondant to create the border around each tier. Add accessories, like stars on wires and toppers, to fit whatever occasion you're celebrating. Create a military inspired cake using airbrushed camouflage fondant on a cake, with white flag shapes made using a cookie cutter or other fondant tools. 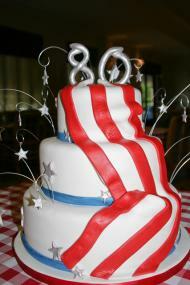 Place mini-fondant flags around the edges of a tiered and stacked cake. To create the flags, you can either piece together a blue square with narrow strips of red and white fondant to make the stripes or you can use a small rectangle of uncolored fondant and paint on the flag design. Bake three cakes in three sizes of star shaped pans. Then cover one in red, one in white, and one in blue and stack them. The type of fondant you should use will depends on where you live, altitude and humidity, but for cut outs stick with a rolled sugar fondant or a stiff marshmallow fondant. You can make your own fondant or buy premade fondant at any craft supply or cake store. Fondant gives a decorated cake a classic look. Try making one of the fondant cake designs listed above for your next military school graduation, homecoming or for the Fourth of July or Memorial Day.